Spoiler alert: Things don't go well. If you're a diehard Apple fan, you might want to avoid watching the videos at the end of this post. Recently, YouTuber JerryRigEverything got his hands on the new jet-black iPhone 7 after reading a peculiar warning on Apple's website. According to the video, while the company assured buyers that the phone's surface is just "as hard as other anodized Apple products," it also said that due to the color's high shine, it "may show fine micro-abrasions with use." As a solution to this problem, Apple recommended buyers protect the phone with a case — something JerryRigEverything claims they've never explicitly suggested before. In order to see just how durable the jet-black iPhone 7 was, he then decided to see how it would fare when faced with everyday items you might stuff in your pocket alongside the phone. Spoiler alert: Things don't go very well. 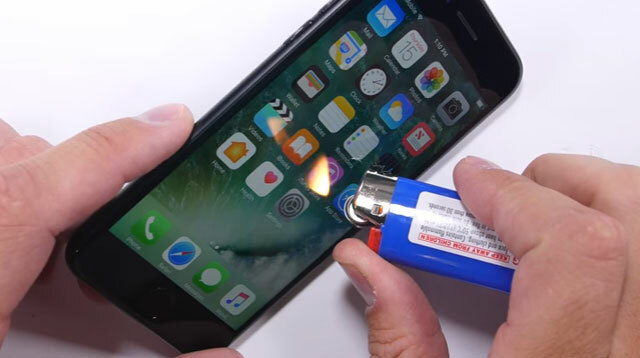 And in case that wasn't brutal enough for you to watch, JerryRigEverything also put the iPhone 7 through his standard durability test — which is essentially just six minutes of him doing everything from scratching it with a razor blade to holding a lighter to its screen.